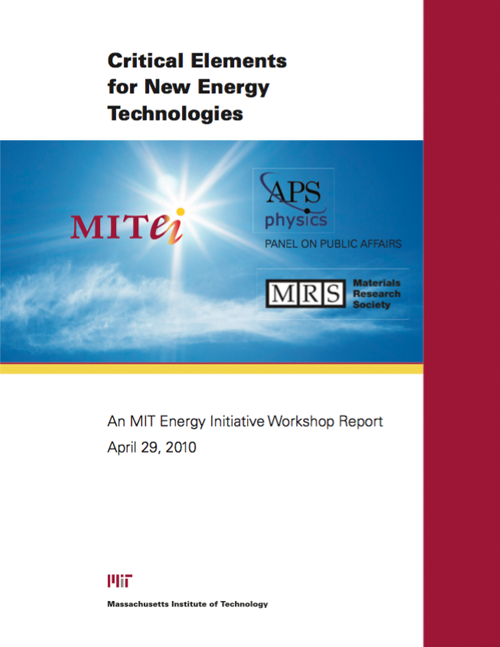 On April 29th, 2010, the MIT Energy Initiative, together with the American Physical Society’s (APS) Panel on Public Affairs (POPA) and the Materials Research Society (MRS), co-sponsored a Workshop on Critical Elements for New Energy Technologies that took place at MITEIs headquarters at MIT. The possibility that important new technologies for the generation, transmission, storage, or use of energy might be constrained by limitations on the availability of certain elements has only recently attracted significant attention. The purpose of the APS/MRS/MITEI workshop was to bring together experts in the diverse areas that bear on this novel issue and to try to determine the context, scope, complexity, and finally, the seriousness of the problem. The workshop also served as the kickoff for an APS/MRS study of energy-critical elements that will attempt to draw conclusions and recommend policy on this subject. This report summarizes the presentations and discussions that took place at the workshop. The core of the report is a rapporteurs overview of the information presented by keynote speakers and the participants comments and points of view as they emerged in extensive discussion sessions. The report identifies many of the key issues that will dominate the discussion of energy-critical elements in the future. A summary of key issues and themes, gleaned from the presentations and discussions, precedes the full rapporteurs report. In keeping with the exploratory nature of the meeting, however, the report refrains from drawing conclusions and making recommendations. The issues at hand span an enormous range of disciplines including mining, mineral extraction and processing, mineralogy, geochemistry, economic geology, materials research, physical chemistry, condensed matter physics, and the associated engineering technologies. The political, geopolitical, and economic aspects of the problems cannot be ignored. The workshop brought together experts from all these fields to focus on whether constraints on availability pose a fundamental problem for the large-scale deployment of novel energy technologies. Participants came from diverse backgrounds and included approximately 40 representatives of academia, government, and industry. The attendees and their affiliations are given in Appendix VI. This invitation-only event was designed to open perspectives and elicit the greatest possible exchange of views, as is appropriate for a meeting that defines the beginning of the APS/MRS process. The workshop was organized around six topical white papers commissioned from experts. Most white papers were circulated in advance, allowing other invitees to read and react. Several participants either asked or were chosen to prepare responses to the white papers. Two of the responses were so pertinent that we decided to reproduce them at length in this report along with the commissioned white papers. During the workshop itself, 30 minutes was devoted to a synopsis of each white paper. Each synopsis was followed by 30 minutes of discussion, including formal response(s) if appropriate. Further open discussions were held at the end of the morning and afternoon sessions. The workshop closed with a summary given by co-chair Jon Price. The focus of the conference was on constraints on availability, whether they are real, and if so, what might be done about them. The constraints might be fundamental, geologic, technical, socioeconomic, political, or economic. Recent conferences have focused on specific elements, rare earths or lithium, for example. The APS/MRS/MITEI workshop focused, instead, on issues, introducing specific elements for illustration. The morning session was devoted to laying out the situation for three specific examples: rare earths, tellurium, and helium. In the afternoon the attention turned to crosscutting issues such as the challenges of developing a substitute for a scarce material; the way that information on mineral production and reserves is gathered by the Minerals Information Team of the US Geological Survey; and the way that other countries have responded to potential shortfalls of energy-critical elements. The workshop was conducted under the Chatham House rule to stimulate fuller discussion of critical issues. That is, with the exception of the white papers and the prepared remarks of respondents, there are no specific attributions in this report. The workshop organizers would like to thank the workshop participants for sharing their time and insight, and for enabling us to have so productive a meeting with such a diverse group of experts. We thank the authors of the white papers and responses for allowing us to use their presentation materials in this report, and the participants who served as scientific secretaries during the discussion sessions. We thank the APS, MRS, and of course, MITEI and its director, Ernie Moniz, for their support. We are grateful to Ms. Jeanette Russo of the APS and Ms. Karen Gibson of MITEI without whose organizational support this workshop would have been impossible. We would like to thank Ms. Rebecca Marshall-Howarth of MITEI for editorial support of the Workshop Report. Finally, we wish to thank Dr. Qudsia Ejaz, who served as rapporteur for this conference. Dr. Ejaz, drafted the Rapporteurs Report from the white papers, the discussion summaries prepared by scientific secretaries, a recording of the meeting, and her own notes on the discussions. She also supervised the preparation and production of the published report. Without her help this report would not have been possible.